Clawfoot tubs bring a vintage style into the bathroom. Sitting on four legs instead of a solid edge and slightly curved, clawfoot tubs can be placed independently in a bathroom, allowing more freedom for remodeling. Although some manufacturers are designing new clawfoot tub styles, the traditional tubs are still available on the market and tend to be drastically less expensive. Standard clawfoot tubs are 5 feet long. The traditional size of a standard clawfoot tub was 5 feet long. The rim is traditionally rolled, giving it a vintage appeal. The legs are sturdy and slightly ornate and the color is usually white or off white. The key when purchasing an antique tub is to verify that the feet are original. Otherwise, retrofitted feet tend to be unstable. Although modern manufacturers offer new colors and details, the 5-foot tub remains the industry standard regarding tub molds. Going smaller or larger than 5 feet typically results in a price increase. The modern manufacturers of standard clawfoot tubs include American Standard, Mott, Crane and Kohler. Along with the traditional 5-foot tub, modern manufacturers have adjusted to the market and now make tubs of varying sizes between 4 and 6 feet. 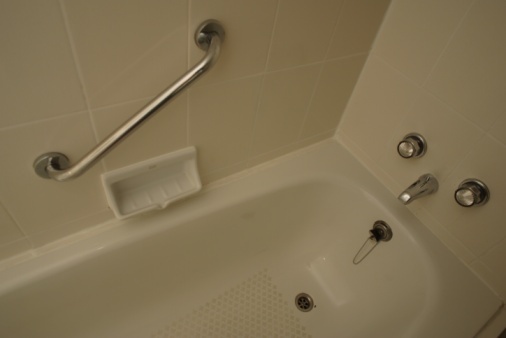 While these additional sizes tend to cost more, the advantage rests in the fact that the tubs are brand new and will require no repairs or maintenance before the tub can be used. For those who decide to select an antique 5-foot tub, it is important to be aware that most antique tubs require refinishing before the tub can be used. Refinishing is a process of painting the entire tub with a fresh coating of porcelain after first sanding down the interior surfaces to remove the original coating. This process can add an additional $500 to $1,000 to the cost of the tub.